And then Warren had an idea: What if the guys were holding Budweisers? The rest is history. 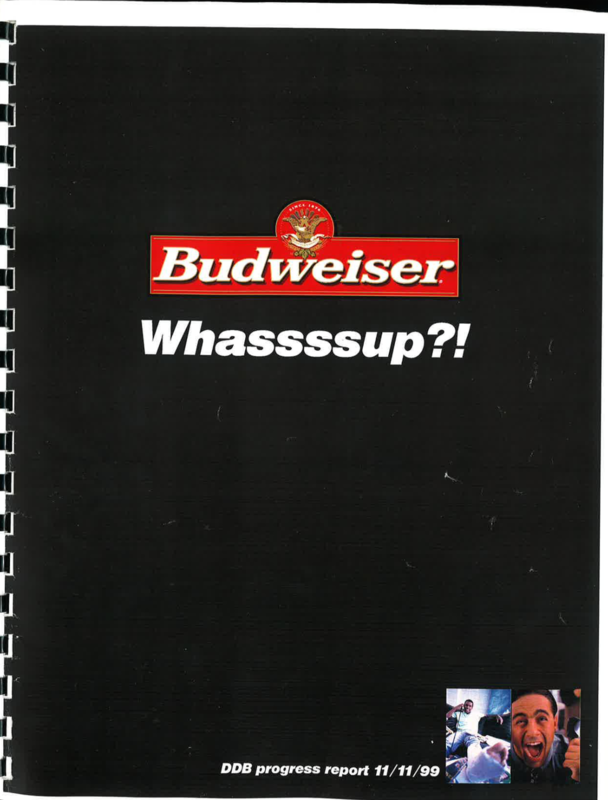 The ad, titled “Whassup?,” debuted on Monday Night Football in December 1999 and aired during Super Bowl XXXIV in 2000. It won countless advertising awards, including a Cannes Grand Prix, and entered the pantheon of iconic American ads — becoming arguably one of the most well known Super Bowl commercials in history. But what of its humble beginnings? How did an ad go viral before going viral was even a thing? Stone and his friends were from Philadelphia, Warren explains, but they shot the entire film in an apartment in New York City. But the magic was there. “This was the same tape we played to the Budweiser clients,” Warren says. 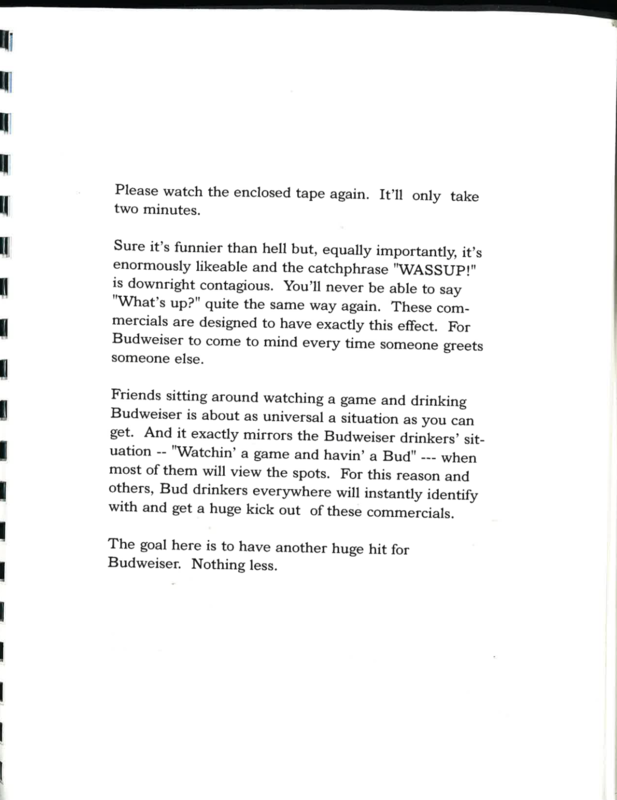 Warren decided he needed to pitch this to the Anheuser-Busch executives, who happened to be in town for one night in October 1999. The pitch for “Whassup?” — a commercial that would end up in CLIO Awards Hall of Fame — happened in a hotel bar. “August Busch IV was in Chicago for a night,” Warren explains. It was October 1999, and Warren and the DDB team were throwing around ideas for Super Bowl 2000 ideas. In other words, Busch enjoyed the grainy, degraded VHS, but it didn’t stand out from the rest of the ideas pitched. It did have one special thing going for it, though: “Luckily for us, our idea was relatively cheap to shoot compared to some of the more cinematically epic ideas,” Warren says. Anheuser-Busch gave DDB the go-ahead. Just as the original film TRUE was shot in New York City, so too was the Budweiser ad — they even used the same cast (with the exception of Dookie), and contracted Stone to direct. “We just recreated it with more money and better equipment,” Warren says. To his relief, “Whassup?” was one of the 10 picked, but didn’t get the 1A slot. Though he eventually landed one there, this time he had to wait to see at what point in the game “Whassup?” would air. The first half went by, and “Whassup?” still hadn’t played. Luckily, the 2000 Super Bowl was what’s now considered one of the greatest Super Bowls ever. The St. Louis Rams led the Tennessee Titans by nine going into halftime. After a second-half rally by the Titans, the game concluded on a last-minute goal-line tackle, which cemented it into the NFL’s Greatest Games series as “The Longest Yard” and earned the Rams their first Super Bowl win. The halftime show (Phil Collins, Christina Aguilera, Enrique Iglesias, Toni Braxton) was a hit. And then, finally, “Whassup?” played, right after halftime. The stars aligned for “Whassup?” to be a hit commercial during the Super Bowl, but Warren says he had no idea what would happen next. The creative director recalls heading back to his hometown of Galway, Ireland, in March 2000, about a month after the Super Bowl. “The first night I was back home — at midnight — all the young drinkers came staggering out of the pubs into the town square, shouting Whassuuuuuup! at each other. I couldn’t believe it,” he says. “It was simultaneously a great buzz and a bit of a chill. I hadn’t envisioned the internet viral effect… the commercial had clearly ‘aired’ in Ireland via the internet. Everybody already knew it and loved it without paying a penny to put it on TV. The ad went on to earn countless advertising awards, beyond the industry’s top achievements — the Cannes Grand Prix, a CLIO and two Emmy nominations. “At the time we were talking to the generation of young (white) drinkers that had swallowed hip-hop culture whole. Eminem had just hit. African-American culture was loved by everyone. White people in the Midwest were trying to sound like they were from Compton. So this was welcomed. And a commercial for Budweiser starring black guys was bound to cause a stir, but our timing was good. The younger generation was on our side. For Warren, the ad helped launch his career — he eventually founded and now runs his own agency in Chicago, The Escape Pod — but he says he’s grown numb to “Whassup?” still echoing throughout pop culture.